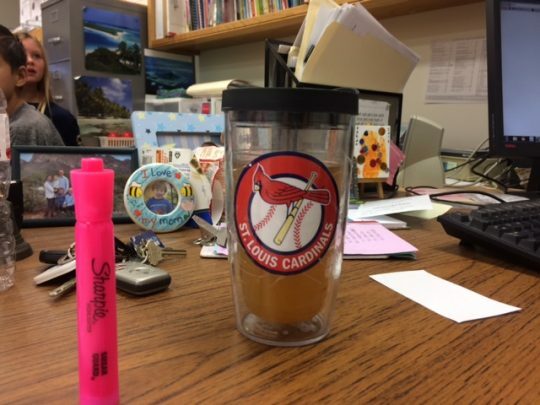 Late last week, one of our sixth grade teachers –sixth graders are our youngest students– was anxiously hanging out by that new fangled coffee maker that you put one tiny cup of coffee in, and out comes a full sized cup of coffee. You know what I’m talking about? Well, it was taking much longer than she had anticipated, and she was worried about getting out to her room on time. I didn’t have a class 1st period, so I said that she should just go out to her classroom, and I’d bring her coffee out to her. 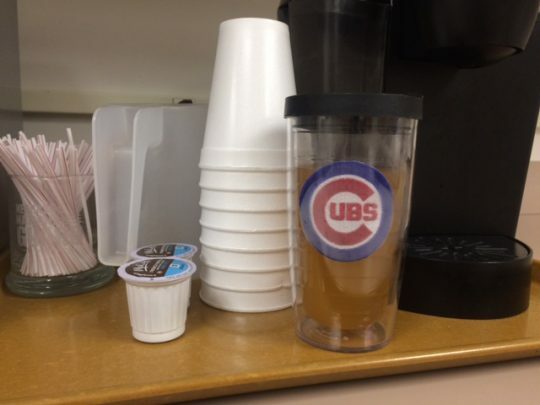 Everything was going along smoothly, until I turned the cup of (and at this point I realized that it might not, in fact, be coffee) around and noticed the logo on the cup itself. This was a real problem. 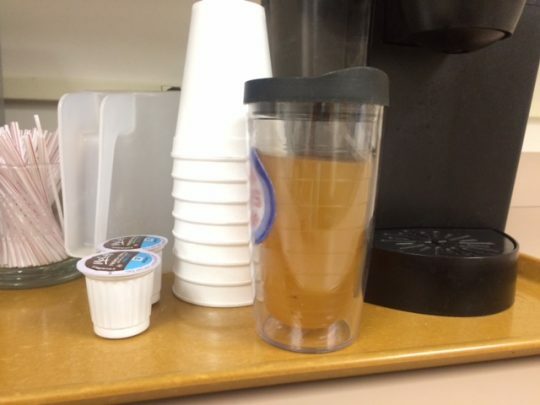 I couldn’t just be seen walking this cup of what I was gradually coming to realize was tea around the school. People would talk. Long standing agreements and treaties would be compromised. Frankly, I was a little bit surprised. I thought I knew on which side of the fence everyone around me stood on this issue. But this sixth grade teacher –I’m withholding her name, not to protect her innocence, but because I have blotted it from my mind– really threw me for a loop. But I had said that I would deliver her pale, hot drink, and deliver it I would. It didn’t take very long to make the switch. All it took was a color printer and a little bit of packing tape. Well, there might have been a little more packing tape involved than was strictly necessary. I wanted to include a photo of her with the mug, but she didn’t think that was a good idea. Ha! I wrote about tea today, too! Also, when you wrote “threw me for a loop”, I thought you used the wrong word, because my students often use “threw” when they should use “through”. “through me for a loop” isn’t correct though, unless you’re talking about getting stitches at the doctor’s office. If I would have written that, I would have written, “thought me for a loop.” At least half the time I write thought for through and visa versa. Did you wash your hands after touching the cup? I thought that highlighter was on its end so it would block our view of the teacher in the picture. I like this mystery teacher. She’s got good taste in baseball. So funny. I like this lady teacher. We’re going to get along well next year. Oh, you’re a tricky one. Excellent choice in replacement sticker, though.